[NOV. 5, 2001] I have some good news and some bad news. I’ll be brief about the latter. The Lady Railers volleyball team, loved by anyone who knows them, has had a super season by any measuring stick you want to use. Their season record of 29-8-1 is among the best in central Illinois. They were the winners of two regular-season tournaments in Champaign and East Peoria. They lost only one Central State Eight Conference match and took second place in the conference. They repeated as IHSA Regional champions. They made the LCHS history books by being the first volleyball team to repeat as IHSA Sectional champions. Only two teams in LCHS history in any sport, boys or girls, have accomplished back-to-back sectional championships. Coach Charissa Howe reached her 100th win early in the season, and her lifetime total now stands at 122 by my calculations. Christina Xamis tied a school service record with eight aces in one game — the sectional semifinal. Senior team members Tina Cook, Kelli Gleason and Darcy White have all been recruited and will play college volleyball. Postseason honors will follow shortly. And that’s just the beginning of this team’s accomplishments. This season, the Lady Railers have formed lifelong relationships and created lasting memories for themselves and their many fans. They have matured through victory and adversity. They have made their families and their fans proud and the photo- developing stores rich. They have been excellent role models and special friends to the little kids who someday want to be just like them. They have stuffed themselves in the LCHS Suburbans and traveled many miles together. They have talked about serious things and laughed about silly things. They have shed some tears with each other. They have fashioned each other’s hairstyles at least once every match. They will always share the memory of being a part of this team. They have grown to love and be loved by their excellent coaches and mentors, Charissa Howe, Tanya Conrady and Ashley Conrady. They have practiced long and hard. They have played duck-duck-goose on many a gym floor. They will never forget the good things about the season of 2001 for as long as they live. 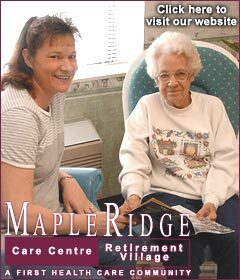 They will reminisce about it often. Memories of the losses and miss-hits will soon disappear while that awesome kill, that smothering block, that service run, those impossible digs off the floor will always be remembered. Their team portrait will hang in a place of honor at LCHS. This team returned home to Lincoln, late Saturday night, one last time, having played their hearts out at the East Peoria High School Super-sectional. Senior Darcy White, the living, breathing epitome of the Railer’s slogan of doing "whatever it takes" was unstoppable at the net with 10 kills and consistent at the service line with seven points. Her leadership almost helped her team pull it off. Senior Kelli Gleason, the team’s floor leader, was, as always, everywhere the ball was, tirelessly handing out 20 assists, knocking down four kills and putting the left-hand tip into places on the other side of the net that no one could get to. Her strong, calming leadership kept the Railers in the match. Senior Tina Cook, the heart and soul of the Railer front line was, Saturday night, the bravest and most brokenhearted athlete I’ve seen in years. In a freak pre-game accident, Tina’s knee was twisted. The injury put her on the bench most of the match instead of where she wanted to be — at the net, doing what she does best. Let this one go, Tina. The result isn’t on your shoulders, even though I heard you say it was. You gave well beyond what you should have tried. You were still leading from the bench. The Lady Railers would not have been in the super-sectional if it wasn’t for your awesome net play all year long. You will play in many more great volleyball matches. My hope is that Saturday’s match will quickly fade from your memory. Kari McFadden, last year’s sophomore sensation, turned into this year’s impassioned junior leader. Her leadership and intensity were ever present on Saturday. Her kills, from almost anywhere on the court, brought the Railer fans to their feet. Kari had five points and five kills for the night. She played to the point of exhaustion and left it all on the court. No one could ask for more. The Railer’s quiet sophomore, Samantha Conrady, dug out serves, made seven of the Railer kills and had four service points. I thought she really stepped up and played. She will increasingly be a force to be reckoned with by her opponents for two more years. Freshman Michelle McFadden was mature and poised well beyond her age Saturday night. 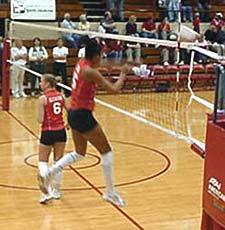 Even without her front-line teammate, Tina Cook, Michelle still made excellent blocks on her own and never seemed shook by the pressure of the moment. And the pressure of the moment was huge! She will be a dominant force on the Railer front line for years to come. The ever-smiling, but always intense on the court, Missy Aper added three crucial service points to the Railer’s 20 points and played excellent defense. Her back-line partner, Christina Xamis, as always, played excellent defense and passed the ball to the front line with her usual precision. Unfortunately, Christina never really got the chance to get on another one of her usual service runs. Missy and Christina are now, and will increasingly be, great team leaders when the 2002 season rolls around. 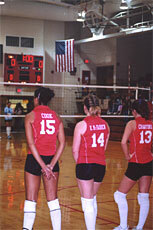 Mindy Crawford was the first person that coach Howe went to when Tina Cook was unable to play. The coach’s confidence in her was evident, and she played well in response to the adversity. Mindy was a steady force on the court, especially in Game 1, when the Railers were fighting for their playoff lives. Kendal Paulus, getting her first taste of varsity postseason action, got one kill and an unsolicited education from several of her opponents. I am sure she will put it to use and return the favor to others in years to come. 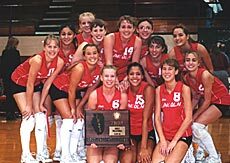 If high school sports are the last true remnant of real sport (and I believe they are), where young people everywhere play with passion and excellence, not for money, but because it’s fun and because they love the game and their teammates, then the 2001 Lady Railer volleyball team was a shining example of that remnant. Congratulations on a great year! And, oh yes, I almost forgot… the bad news. The Lady Railers lost their super-sectional match Saturday night to some team from up north of here. With all the good things to remember, I can’t remember who the other team was or what the final score was. Oh, well. It isn’t anywhere near as important as these excellent young women who played their hearts out this year and made us proud! [NOV. 5, 2001] With a record of 32-7, the Mount Pulaski girls went to battle against neighboring Warrensburg-Latham, with a 31–7 record. Winning in two rounds, 15-12, 15-5, in the Class A super-sectional at Momence on Saturday, the Hilltoppers are on the road to state. 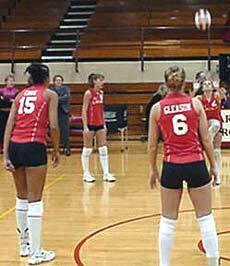 Service points: Erin Schmidt 10; kills: Mary Olson 14; blocks: Olson and Laura Reeter 3; assists: Tiffany Conaway 37. The Class A state tournament will be in Normal on Friday and Saturday. Mount Pulaski plays against Benton in Match 4, at 7 p.m. If Mount Pulaski wins, they play in Match 6 at noon against the winner of Match 3, either Quincy Notre Dame or Byron. [NOV. 5, 2001] Amazingly, coach Kevin Crawford and his Lincoln Christian College Angels advanced to the Elite Eight at nationals. Equally amazingly, they once again made it to the Final Four and brought home a third-place place trophy! That makes six trips to the national tournament, including a national title, two third-place finishes, one fourth and two Elite Eights! They did lose a tough match to the eventual champions from Mid-America Bible College but went on to beat Baptist Bible of Missouri for the second time in the three-day tournament. While at the tournament, Becky Nangle and Breanne Prunty were named to both the national all-tourney team and as first team All-Americans! Christine O’Malley was also selected as a second team All-American, and Heather Brock was named a National Scholar athlete. Not to be outdone was head coach Kevin Crawford, who was named NCCAA National Coach of the Year for the second time. [NOV. 5, 2001] Lincoln College opened the men’s basketball season with a split this past weekend. The Lynx defeated Mineral Area 89-83 on Saturday, after dropping the opener 85-64 to Three Rivers on Friday night. The Lynx open the home season Monday against Carl Sandburg at 7:30 p.m., following the season opener for the Lady Lynx at 5:30 p.m. The Lynx used a balanced attack against Mineral Area as four players reached double figures. James Roberson led the way with 21 points on 7-of-11 shooting from the floor, including 5-of-8 from 3-point range. Derik Hollyfield was close behind with 20 points on 6-of-12 shooting, including 4-of-5 from 3-point land. Also hitting double figures for coach B.J. McCullum were Amir Major with 16 and Steve Turner with 11. Lincoln won the game at the foul line, hitting on 24-of-33 attempts while Mineral Area was 12-of-20. The Lynx managed to shoot 38 percent from the floor but hit on 57 percent of its 3-point shots. Major was the top rebounder for Lincoln with eight, and Roberson contributed five assists to go with his 21 points. In the opener, the Lynx fell behind early and were not able to recover. Three Rivers raced to a 39-25 halftime lead as Lincoln managed just 26 percent shooting in the first half. The Lynx improved to 40 percent the second half, but they could not overtake the winners. Hollyfield provided the majority of the Lynx scoring, with 29 points on 8-of-16 shooting with 5-of-7 coming from 3-point range. Lincoln College (89) — Paris Williams 1-1-0-0-2; James Roberson 7-11-2-2-21; Josh Clark 1-4-3-4-5; Gene Reed 0-0-0-0-0; Mike Fowler 2-7-2-2-7; Steve Turner 3-10-3-4-11; Mike Sams 3-9-1-3-7; Amir Major 3-14-9-12-16; Derik Hollyfield 6-12-4-6-20; Sam Jackson 0-0-0-0-0. Three-point goals: Roberson 5, Fowler 1, Turner 2, Major 1, Hollyfield 4. Mineral Area (83) — Terry Tessary 4-7-2-2-13; Bryan Turner 4-12-2-2-10;Torry Saxton 7-1-6-12-20;Ryan Weatherspoon 1-4-2-2-4; Norman Prather 10-14-0-0-24; Karnau Catron 4-8-0-2-8; Chavis Landfair 2-6-0-0-4. Three-point goals: Tessary 3, Prather 4. Lincoln College (64) — Williams 1-2-0-0-2; Roberson 3-6-1-4-8; Clark 0-1-1-2-1; Reed 0-0-0-0-0; Fowler 0-0-0-0-0; Turner 2-11-2-6-7; Kehr 0-2-0-0-0; Sams 2-4-2-3-6; Major 1-5-5-6-8; Hollyfield 8-16-8-9-29; Jackson 1-4-1-2-3. Three-point goals: Roberson 1, Turner 1, Major 1, Hollyfield 5. Three Rivers (85) — Gipson 4-11-0-0-12; McKinney 1-4-0-0-3; Ibrahim 1-5-0-0-2; Stamps 4-8-2-4-10; Johnson 6-14-2-3-16; Alston 1-5-2-3-4; Zayas 3-14-1-3-8; Sprewell 5-7-0-0-10; Akintunde 1-2-1-1-3; Mauricette 8-10-1-3-17. Three-point goals: Gipson 4, McKinney 1, Johnson 2, Zayas 1. [NOV. 5, 2001] Lincoln Preachers hit the courts in Grayson, Ky., on Friday evening. LCC held the lead by 10 at the half, 51- 41, but in a hard-fought turnaround they were down by three as the buzzer sounded game’s end for a loss, 96-93. LCC stats: Clark 14-2-33, Holderby 1-0-2, Below 6-2-14, Turney 1-0-2, Okusami 9-1-19, Grooms 2-0-4, Searby 6-2-19, totaling 39- 9-93. [NOV. 5, 2001] The Lincoln College men defeated Principia College 149-65 in swimming Saturday while the Lady Lynx were beaten by Principia 109-76. 200 freestyle — 1. 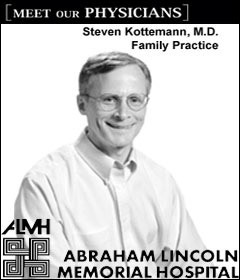 Scott Sampson, 1:52; 2. Kestner, 1:52.61; 3. James Brooks, 1:57.23. 200 IM — 1. Ramiro Palmer, 1:59.74; 2. Joe Krysak, 2:05.19; 3. Zach Welch, 2:09.63. [NOV. 5, 2001] Usually when your favorite football team is down 13-0 late in the first half of a game against a good team on the road, it’s hard to have any good feelings about it. But somehow, during gut-check time, the Illinois Fighting Illini must have gotten in line twice, as they not only fought back to get close by halftime but went on to clobber the Purdue Boilermakers 38-13 before 61,568 stunned fans at Ross-Ade stadium. And all of a sudden, the Illini’s bowl schedule is getting rosier week by week. I can almost see myself lying on a beach... I mean, I can see the Illini in a much bigger bowl matchup than I ever dreamed about during the preseason. If you don’t give the game ball this week to the defense, you should never be allowed to watch another game! The defense kept Illinois in the game in the first half but then returned two INTs for scores in the second half, as the Illini put away a tough Purdue team that most Big 10 teams have struggled against the last three years! Bobby Jackson had a spectacular 83-yard slicin’ and dicin’ interception return for a touchdown. Not to be outdone, our favorite player, Christian Morton returned one 62 yards to the house, and the Illini were heading to a beach somewhere! I'm not even going to talk about how this game puts Illinois in a tie for first or what bowl implications may loom because of this HUGE victory. The voice of reason says to keep playing them one at a time and we will worry about bowl games when they send out the invitations. Brandon Lloyd did have yet another stellar effort by making six grabs while piling up 112 yards. Kurt Kittner incredibly threw for 299 yards and two touchdowns in spite of throwing four interceptions. He is due to really cut loose and have a couple of big games. Wouldn’t it be nice to see him ring up PSU, OSU and NW? Up next on the Illinois schedule is a very tough date with a rejuvenated Penn State team. It is very difficult to beat a Joe Pa team, but if ever there were a sense of urgency, there would be NO time like next Saturday to settle a long-standing score with Mr. Paterno and his Nittany Lions! [NOV. 3, 2001] Lincoln College begins the women’s basketball season Monday at Carl Sandburg under the direction of fourth-year coach Carol Wilson. Last season the Lady Lynx won 20 games for the first time since the 1995-96 season. "With the players we have returning, and with help from some of our freshman recruits, we are looking for another good season," said Wilson. Wilson has turned the program into a winning tradition, as she was able to win nine games the first year, 18 in her second season and 20 last year. Seven letter winners return from last year, led by Ronni Beebe, who averaged 13.3 per game. Tiffany Thomas, who played only 15 games last season, returns with a 9.5 average, and Jesse Dullard and Sarah McLaughlin both return with averages above seven per game. Other letter winners include Tammy Bausley, Heather Dobey and Kim Massenburg. "Injuries have hindered us early in the practice session," said Wilson. "Bausley, Dobey and Thomas have all missed valuable practice time, but I think they will be able to help at least part-time when the season opens. "Jenny Story has played exceptionally well in the preseason and may be one of our more versatile players. She is able to play most positions and is even capable of defending the post. Angie Bossingham, a transfer from ICC, gives us a 3-point threat which should help break zones. Right now we are rotating her and Ronni Beebe at the point. We could put five guards on the floor at one time if the competition dictates. "Story and Jess Dullard play a lot taller than they really are, and they are not afraid to mix it up a little defending the post players. We are looking for Sarah McLaughlin to come off the bench and give us a spark. She gives our lineup a different look, and she is a momentum changer. "We should be a lot deeper than last season, I believe we may be able to play as many as 12 players, which should keep us fresh. Once the girls realize and accept their roles on the team, we could be very competitive. Most of these girls are used to playing the entire game in high school, and if they can adjust to playing 15-20 minutes a game, we should have fresh players on the court at all times." Coach Wilson continued, "Lakeisha Graham, Zabrina Harper and Victoria Scott have a lot of athletic ability and quickness, and Scott can play either guard or post up. Kim Calhoun and Ashley Sims give us a physical presence and a lot of bulk; they just need to work on their rebounding and get in their minds that every ball belongs to them. "Right now our defense is probably our weakest area. We need to become more aggressive and communicate better. Our weak-side help needs to improve along with our rebounding; however, we have the potential. "I feel we can compete for the conference title, with Parkland, John Wood and Lake Land as the strongest contenders. The conference should be stronger from top to bottom than in the past. Our early schedule is very tough, but that should help prepare us for the conference, as there are no easy wins." [NOV. 2, 2001] Never before in Lady Railer volleyball history has the sectional trophy found its way into the LCHS trophy case two years in a row. Until last night. The Lady Railers claimed their second successive sectional title, beating another fired-up underdog, the Champaign Centennial Chargers, 15-13, 15-5. The Lady Railers will challenge Normal Community High School in the East Peoria super-sectional on Saturday. (If you have one ounce of Railer spirit in your blood, you won’t miss it.) Normal Community defeated its twin-city rival Bloomington last night in the Metamora Sectional final. While the title was a repeat, it certainly wasn’t a duplicate of last year’s title run. Last year, some sports writers (whose names shall remain anonymous to protect the guilty) tried to suggest that the Lady Railers won because they "snuck up" on other teams. There is an ancient Latin word for that suggestion: hogwash. Last year’s fourth-place team earned every victory they got. Regardless, this year there was certainly no sneaking up on anyone. The Railers had a big red bull’s-eye painted on them — the No. 1 seed in their sectional complex. They were the favorite and they were expected to win. And win they did! In last night’s sectional championship match, an adrenaline-powered Centennial team hit the court, with fervor, for Game 1. They were intent on knocking off the No. 1 seed, just as they had knocked off the No. 2 seed in the sectional semifinal match on Tuesday. The adrenaline lasted for most of the first game and never appeared in Game 2 of the match. The Lady Railers withstood the rush. In Game 1, both teams traded points and side-out calls until the score was Railers 5, Chargers 4. Then, for the next forever, it seemed, the Chargers could do no wrong. Two aces by the Centennial server and some Railer miss-hits and the scoreboard read 5-8 in favor of the Chargers. Coach Howe called timeout. During the timeout all of the Railer coaches appeared to have some very specific "suggestions" to make to the Railer starters. In spite of this, right after the timeout, Centennial almost immediately scored two more points, and the Railers were down 5-10. I hoped coach Howe would call another timeout. She didn’t. She was right. Instead, coach Howe let the Railers dig themselves out the hole they had dug for themselves. And, little by little, they did just that. Kari McFadden’s kill stopped the "bleeding" and gave Lincoln the serve. Kari then rotated to the service line and Darcy White finished the matter with an emphatic kill to give the Railers six points. Moments later, with Kelli Gleason serving, Darcy gave the Chargers an instant replay and the Railers trailed 8-10. But Darcy wasn’t finished by any means. She rotated to the service line, and after a Samantha Conrady kill the Railers had 9. In a crucial three-point series Missy Aper checked in to serve and Kari McFadden stayed in to take over at the net. Service Missy, Kari dink. Service Missy, Kari kill, times two. The Railers were finally back on top, 12-11. They would never again relinquish the lead. Kelli Gleason got the next Lincoln point, and then "the finisher," Christina Xamis, tallied the final two. Opponent’s adrenaline rush over. Game 1 statistics showed four service points each for Kari McFadden and Kelli Gleason; three each for Missy Aper and Christina Xamis (who, by the way, tied the LCHS record on Tuesday night for most service aces in a single match, with eight). Darcy White rounded out the first-game scoring with one service point. With all of its initial fight gone, Centennial put up only a small challenge in Game 2 of the match. Lincoln quickly jumped out to a 4-0 lead behind the consistently good serving of Kari McFadden. A momentary Charger surge brought the score to 4-3, but Centennial never got closer. The Lady Railers quickly ran the score to 8-3, then 12-5, then 15-5, and it was all over but the shoutin’. The Railer team and fans had an extended floor celebration before making the long drive back to LCHS. Overall, the Railers were led offensively by the accurate and powerful net play of senior Darcy White, especially in Game 2. While each team member on the front line accounted for several kills and well-placed dinks, Darcy’s accuracy and strength were exceptional. Darcy’s match total stood at nine kills. Kelli Gleason led the scoring with 10 service points, and Kari McFadden added eight more. At crunch time in Game 2, Tina Cook accounted for two of the final three game-finishing points with her net play. Kari and Tina had five kills each. As always, Kelli Gleason was the playmaker, with 23 assists, and also several perfectly placed dinks for points. Missy Aper’s three service points in Game 1 were critical. The Lady Railers will prepare today and tomorrow for their super-sectional match with Normal Community on Saturday. Match time is 7 p.m. The doors will open at 5:45. The super-sectional will be a rematch of last year’s sectional final, which Lincoln won. It would be a gross understatement to say that the two teams know each other well and that each team wants to win badly. Take the intense rivalry that exists between these two teams, add in the fact that Lincoln ended Normal’s season last year, mix in a berth to the state tournament quarterfinal round for the winner, and you have almost all the hype that high school competition can offer. As for me, I predict a Railer victory in a fight-to-the-death three-game match. But I’m just a 100 percent totally biased Railer fan, partially disguised as a journalist. Ladies, you’ll have to make your own dream come true. I believe you will. Everyone I talked to last night believes you will. The crucial question is: Do you believe you will? I guess that some (not me) might say you’re the underdog on Saturday. After being the No. 1 seed all week in the sectionals, maybe being the underdog will be a relief. When you win, you’ll do it by what you have been doing all year. Doing whatever it takes. We’ll be cheering you on as always. Remember, I already have my seat at Redbird secured. I have reserved a whole row of seats for you — right on the floor. I won’t go without you. [NOV. 2, 2001] The team that sank Olympia in last Tuesday’s sectional playoffs, Central Catholic, was put down in Thursday night’s game with Mount Pulaski. Mount Pulaski defeated Central Catholic in two matches, 15-8, 15-7. Central Catholic — Service points: Rachael Lockett 5; kills: Jaclyn Fike 10; blocks: Michelle Donnelly, Katie Olson 3; assists: Olson 21. The Hilltoppers play Warrensburg-Lathem in the super-sectionals at 7 p.m. Saturday at Momence. [NOV. 1, 2001] B.J. McCullum will be trying to win 20 games for the fourth-straight season when Lincoln College opens its season Friday in the Three Rivers Classic basketball tournament at Poplur Bluffs, Mo. If successful, McCullum will be the first to win 20 games for four straight seasons since Joe O'Brien accomplished the feat from 1991-1995. Last year the Lynx finished with a 26-7 record, and expectations are high again this year. The Lynx are rated fourth in the nation in Division II preseason poll. "The fact that our recruiting class is talented and with our returning sophomores has given the pollsters reason to rank us high," said McCullum. "Unfortunately with the loss of Brian Thorsen for the season, due to an ACL injury, our task will be a little tougher," continued McCullum. "We do have a talented group of freshmen and a very intelligent team. This group of kids has been well coached in high school, and they pick up things very quickly. "The wing and point positions should be where most of our scoring comes from. Derik Hollyfield from Aurora West and Steve Turner of Peoria Richwoods should be our strongest scorers, with a lot of help coming from Andrew Kehr, sophomore from Alexis; Gene Reed, sophomore from Atwood Hammond; and James Roberson from Chicago Robeson. "Michael Fowler has been doing the best job at the point on our offense, and we should get a lot of help from Paris Williams, a Lincoln High School grad. Roberson could also play the point if needed. "In the front court Mike Sams, a sophomore from Quincy, returns and will be counted on along with Sam Jackson, a transfer from State Fair. Two freshmen will be counted on heavily to help Sams and Jackson. Jamaal Thompson (Aurora West) and Amir Major (Robeson) will be needed to help on the boards and play in the post." The Lynx mentor continued, "I think we have adequate 3-point shooters, and we have a very balanced shooting team. Some of our post players are capable of going out and hitting the 15-foot shot. Probably our biggest problem will be rebounding. We need to become more physical with our inside game. "We were voted as the favorite to win our third-straight conference title; however, I think the conference will be well balanced from top to bottom. Danville, Illinois Central, and Lewis & Clark are probably three of the stronger teams." Sams scored 144 points for the Lynx last season as a part-time starter and is the only one of the three with over 100 points. Gone from last year are Marlon Brooks (17.1), Jay Bates (15.2), Creston Coleman (10.3), Eric Crockrell (11.4), Brian Moffitt (9.6) and Jerron Hobson (8.2). No Lincoln College coach has ever started with four 20-win seasons. Allen Pickering, current athletic director, had 11 seasons of 20 wins but did not win 20 in his first season. O’Brien also failed to win 20 in his first season, before finishing with four straight 20-win seasons. The record for most consecutive 20-win seasons was set at six by Pickering. [NOV. 1, 2001] Coach Dan Hemenway begins his 12th season as swim coach at Lincoln College when the Lynx open their season Friday at Western Illinois University. Hemenway has compiled an amazing record at LC, with 11 straight appearances in the national tournament. The Lynx men have finished second in the nation the past three years, and the women finished second in 2000. Despite all of the success in the pool, Hemenway said, "I am really proud that last year’s team finished first in the nation in grade-point average. That was a huge feather in our cap. All of the other awards are great, but that is the highlight." Lincoln College hopes to be more competitive on the women’s side this season with a larger class of girls. Last season the Lynx had quality but did not have numbers. "It was extremely tough to score high in team events due to our lack of numbers last year," said Hemenway. "We are looking for Liz Wilson and Bonnie DiFoggio to be our leaders this season as co-captains of the squad. Both had good years last season, and we expect more of the same this season. "I feel we should compete for the regional title and should finish in the top five in nationals. With the quality and the numbers we have, we should do well in dual meets. Our first meet at Western will be one of the toughest, as we swim against four-year schools. "Angela Couch, a freshman from Lincoln High School, is expected to bolster our distance events this season, with Leslie Seago showing a lot of promise. We aren’t sure what events she will be swimming, at this time. Rachel Willenborg has been outstanding in early workouts in the fly events, and we look for her to have a good season. "Carmen Altman shows a lot of potential as a diver, which gives us an opportunity to score points in that event. Several others have shown they will be able to help us in the team scoring." On the men’s side, "We have several sophomores returning who were selected as All-Americans last season," said Hemenway. "We should be in the running for the regional title, and I feel we have an outside shot at placing at least second in the nationals once again." Heading the list of returnees for coach Hemenway will be Doug Garofalo in the distance events. He will be joined in the distance events by freshman Scott Sampson. Ramiro Palmer is being counted on heavily in the breaststroke and IM after a very successful year last season. Others being counted on heavily are Matt Ryther in distance and IM, Zach Welch in the butterfly and breaststroke, and Sean Calhoun and Tim Philosophos in diving. Welch and Garofalo are serving as co-captains this season. "We have a large group of freshmen who will be counted on to score points and gain experience for next season," said Hemenway. "Obviously our sophomores will be the backbone of the team with the experience they gained last season."